For the settlement of ancient Attica, see Maroneia (Attica). "Maronia" redirects here. For the genus of moth, see Maronia (moth). 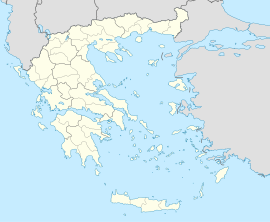 Maroneia (Greek: Μαρώνεια, Bulgarian: Марония, Turkish: Maronya) is a village and a former municipality in the Rhodope regional unit, East Macedonia and Thrace, Greece. Since the 2011 local government reform it is part of the municipality Maroneia-Sapes, of which it is a municipal unit. The municipal unit has an area of 287.155 km2. Population 6,350 (2011). The seat of the municipality was in Xylagani. Maroneia was close to the Ismaros mentioned by Homer in the Odyssey. Some scholars identify Maroneia with his Ismaros. Homer has Odysseus plundering the city but sparing Maron, whom he identifies as a priest of Apollo. Maron presents Odysseus with a gift of wine, as well as with gold and silver. In the era of Ancient Greece and Rome, Maroneia was famous for its wine production. The wine was esteemed everywhere; it was said to possess the odor of nectar, and to be capable of mixture with twenty or more times its quantity with water. That the people of Maroneia venerated Dionysus, we learn not just from its famous Dionysian Sanctuary, the foundations of which can still be seen today, but also from the city's coins. In 200 BCE it was taken by Philip V of Macedon; and when he was ordered by the Romans to evacuate the towns of Thrace, he vented his rage by slaughtering a great number of the inhabitants of the city. The Roman Republic subsequently granted Maroneia to Attalus, King of Pergamon, but almost immediately revoked their gift and declared it a free city. Maroneia was the largest and most important of all ancient Greek colonies of Western Thrace. The city owed its prosperity to the extensive and rich territory and also to the port which favored the development of intense commercial activity. Furthermore, Romans had granted many privileges to the city, such as the proclamation its freedom and the increase of its territory, where a dense network of rural settlements was developed. In December 1877 Captain Petko Voyvoda overthrew the Ottoman rule and established a free administration in the town. It is the seat of a Roman Catholic titular bishopric called Maronea. ^ Diodorus Siculus. Bibliotheca historica (Historical Library). 1.20. ^ Pliny. Naturalis Historia. 4.11.18. ^ Isaac, B., (1986), The Greek Settlements in Thrace Until the Macedonian Conquest, page 113. BRILL. ^ "Maronea". catholic-hierarchy.org. Retrieved 8 July 2017. This article incorporates text from a publication now in the public domain: Smith, William, ed. (1854–1857). "Maroneia". Dictionary of Greek and Roman Geography. London: John Murray. Durando, Furio, Greece, a guide to the archaeological sites, 2004. Herbermann, Charles, ed. (1913). "Maronia" . Catholic Encyclopedia. New York: Robert Appleton Company. Smith, William, (1857), Dictionary of Greek and Roman Geography. Psoma, Selene, Chryssa Karadima and Domna Terzopoulou, The Coins from Maroneia and the Classical City at Molyvoti: a contribution to the history of Aegean Thrace (Athens: Diffusion de Boccard, 2008) (Meletemata, 62). Wikimedia Commons has media related to Maronia. Wikivoyage has a travel guide for Maroneia. This page was last edited on 28 October 2018, at 12:39 (UTC).